President Kufuor on official visit to Britain. 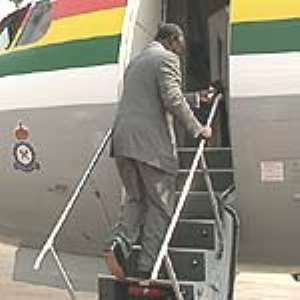 The President John Agyekum Kufuor on Friday evening left Accra for an official visit to London, Britain. Nana Akufo -Addo, Minister of Foreign Affairs, Mr Allan Kyerematen Minister of Trade, Industries and Special Presidential Initiates, Ambassador D.K Osei, Secretary to President Kufuor and Mr Kwabena Adjapong Presidential Spokesperson accompanied the President. Also on the trip are heads of private sector institutions, which included Mr Ishmael Yamson, Chairman of Uniliver, Dr. Charles Mensah, Chief Executive of VALCO, Mr Kwesi Abeasi, Chief Executive of Ghana Investment Promotion Council and Mrs Elizabeth Joyce Villas, President of the Private Enterprises Foundation. Breifying the Press earlier, Mr Adjapong said President Kufuor would confer with his British counterpart Mr. Tony Bliar on matters of bilateral interest to Ghana and Britain. He said from Britain, President Kufuor and his entourage would leave for South Africa to participate in the swearing in ceremony of President Thambo Mbeki for another five-year term. At the Kotoka International Airport to see President Kufuor off were Ministers of State, Ibrahim Omar, the Dean of the Diplomatic Corps, who is also the Palestinian Ambassador to Ghana, the Inspector General of Police, Nana Owusu-Nsiah and Lieutenant Colonel Seth Obeng the Chief of Staff.